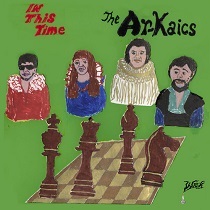 The Ar-Kaics wade in the waters of troglodyte teenbeat 60s-style punk. They backstroke in the proto gray area eras before these subgenres of rock and roll had names or rules. It's charming and fun, but keep your guard up or it'll sink it's teeth into your jugular. The reason why the tried-and-true introduction to 60s garage remains compilations (e.g. Nuggets, the Pebbles and Back from the Grave series, etc.) is that hardly any of those bands could manage a solid, or even moderately flawed LP. Hell, many couldnt even pull off a decent B-side. There was just something about the raw stuff thats captured best by seven inches of wax. While the Ar-Kaics, namely Johnny Ward, Kevin Longendyke, Patty Conway, and Tim Abbondelo, can be aptly described as retro, they arent hindered by any problems that traditionally plague a lot of retro bands, which makes what they do pretty dang rare; they arent the only ones pulling it off, but the list is indeed a short one. Here they pull off a sweet trick early, as the emphatic pulse-stomp of opener Dont Go With Him just rolls sans interruption into the more up-tempo near-jangler Some People. What they both share, along with sharp, period-derived but impressively fluid guitar and echo-laden vocals that avoid the overwrought, is a rhythmic sensibility that can be appropriately assessed as engagingly unfussy. No Vacancy is a more driving rocker, but with some airy backing vocal counterpoint in the chorus, plus a sweet false ending thats followed by a convincing lead singer freak-out. The Velvet Underground is referenced in connection to Shes Obsessed With Herself, which is certainly graspable, though its a bit like Lou, Moe, Sterling, and Doug (no John in this scenario) had formed not in NYC but in 65 Detroit as they worked out their feelings about Mitch Ryder. In a word: swank. The records consistently high level of songwriting is notably diverse, with Sick n Tired a solid example of the sound heard on the aforementioned Back From the Grave volumes and the punk entries in the Nuggets vinyl series, and with just the right amount of sneery attitude. Diverging from this template is Cut Me Down, which offers a mildly VU-like psych pulse, in part due to the decidedly Moe-like drums. Complete with some tasty organ, it trots the bases in the ballpark of the Paisley Underground (bringing Spacemen 3 to mind, even). And speaking of sidestepping the hackneyed, Distemper is more straightforwardly garage-like, but sports lyrics that are colorful rather than clichéd as it leads up to what will likely prove the records enduring gem. Its Her Eyes combines pitch-perfect vocals with guitar lines repeatedly hitting the sweet spot as the rhythm never falters. From there, What You Do blends some Dylan-ish emoting with a load of amp fuzz, rattle-shake and a tinkle of keys, while You Turn Me Bad delivers a generous slice of textbook 60s swagger.  TheVinylDistrict.com EXCELLENT! !